Tonight I've just put my little baby to bed, for the last time in the year of his birth. I whispered sweet nothings to him in his ear about how loved he is, how special he has made this year, our baby, how he has completed us in the only way we can be completed. How this has been his year. His year. Oh I feel so much regret now that it mattered even for a moment earlier on in this year when he was no longer a girl. Back when those scans revealed what we thought was going to be one thing, but turned out to be another. That is mattered a sonographer had got his gender wrong on the first look. Regret that is hit me as hard as it did and sent me down the path of a grief spiral once again. Yet another guilt of grief moment to carry along. Regret. It shouldn't have mattered and it certainly does not matter now. I feel so foolish that I worried at all his gender, because he was my last baby, could affect our bond. Because that boy is mine, he is him and I love him so. And the end of 2016 feels significant, a year I'm finding myself wanting to cling on to. The year my last baby was born. His year. Maybe because this is it. 2017 sees the beginning of a brand new era for us. New baby days all done. Pregnancy days all done. No new babies to plan and prepare for. Now we're into the fully fledged childhood years! We're parents raising three rainbow beautiful boys. After Anabelle is becoming a subtitle Raising Rainbows. Maybe because this year I really have to deal with it and make my absolute peace with it; the biggest 'it' I've buried my head in the sand about for so long, because we really are not having anymore babies, which means we are really really never having an earth daughter. Oh there is so much to explore my head with around that, but that is another blog for another time. 2017 will have to be my year for that. More conscious healing. I remember feeling somewhat like this six years ago, as 2010 (click to open) drew to a close. Wanting to cling on to the year my first baby was born. Not wanting to pass into another year. Then, it felt like the symbolic change of the year was moving further away from her. Grief was still so so new and so so raw then. I had no idea what 2011 had in store. 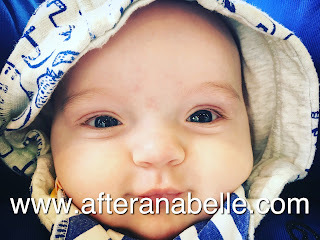 Of course 2011 gave us Alexander, another incredibly precious year, when the fledging whisp of healing began, but on the night of 31st December 2010 we couldn't see any rainbow and we certainly couldn't see any healing. Oh how far we've come and I feel so blessed. Especially this year bringing another little baby home. But tonight I'm feeling some bizzare juxtaposition. The end of 2010 hit me hard and I'm feeling a sad nostalgia as 2016 draws to a close. My first baby and my last baby. Their years. 2016 has been indescribably good to us. I may have started off the year very poorly with a series of colds between us all and pneumonia and all that for me, but the rest of the year more than made up for it! 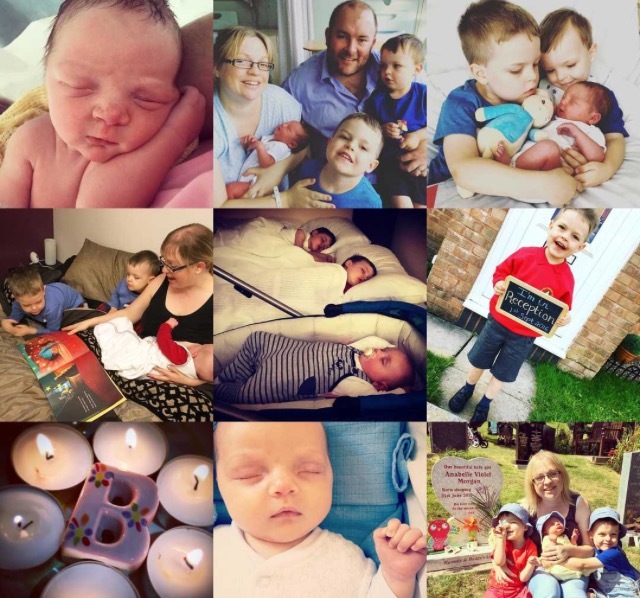 Joining on the instagram "2016 Best Nine" photos this afternoon highlighted again the absolute sparkle and shine our little baby has added to our family this year, when all nine photos were from the second half of this year and he featured in all but two of them! This year I have carried on my thing of noting down all the happy, important, funny, wonderful days and moments. From the big things, little things, every day things. I love looking back on them on New Years Eve now. The highlights of my year 2016! 1st - horrible start to year with Xander's school burnt down to nothing. Xander's sad but cute response Initially quite interested in photos on FB to see what was happening until he realised it was very broken and fireman Sam couldn't rescue it this time and then took himself off to bed for 5 minutes saying he felt very sad and didn't like fire on his school. Poor baby! 3rd - playing tickle and raspberry monsters on the bed with both boys! Very excited small ones - Wound them up good and proper! 4th - the duplo barn Xander built for all his animals after our little animals brainstorm. 7th - first baby tiny scan. 8+1. 25th - Xander back into school today, not being dazed and going straight to to play! 27th - Zac having his first bedtime wee wee in the potty. 30th - Zac in the pool - totally blown away by his confidence. Hasn't been in a pool for a year, and has only been in a few times in total his whole life. But today, with a woggle, he quickly learnt to balance himself, then kicked his legs and moved his arms to swim himself around - totally independent and awesome. So proud. Little natural water baby! 5th - X being really cute and told Zac off for climbing on me saying he had to be careful because there was a baby in my tummy! 6th - Zac surprising us knowing what 2,3,8 was on number jacks game! 9th - feeling so very poorly but loved hearing the boys play together from my sick bed upstairs. 13th - sweet darling Small who went to find a wet wipe and then wiped my face because I was crying. 19th - the effort and time Xander took on his duplo house with Nana and Bampi. 4 hours before it was totally finished. Loved all the thought and ideas he put into it, the attic and the roof. extension for a toilet, dining room with table and chairs, steps up to the attic and a sunflower in the garden like Bampi's garden. Amazing! 26th - discovering Xander can read 1000! 7th - a new car for my birthday! 11th - Xander spelling at bath time with his bath letters. 'Mummy' but backwards! 12th - Crack of dawn conversations about childbirth with my 4 year old! Try to answer he questions that a c-sec won't leave me with a pouch like a kangeroo and that not every mummy needs to have babies out of tummies, some babies are born out of foo's at the bottom. Told him Belle born out of foo, and he nearly was but he got stuck so a Dr helped him out of my tummy, so Zac came out of my tummy and so will this one! 17th - most normal day since 6th Feb. Lolipops am, blooms pm, boating lake! 19th - the boys playing with their cousins and time at the boating lake, watching Zachy really get to grips with his scooter! 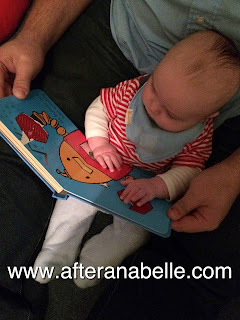 19th - Baby finally decided to be properly wiggly, so wiggly even Daddy felt it! The earliest for him. 23rd - Zac trying to tell me about his day at nursery when I arrived to pick him up - play friends, painting, then key worker prompted outside and he said garden! 31st - few days with Hannah and Katie. Dinosaur Land and swimming. 3rd - feeling better about being told girl and then it changing to boy after a very turbulent few days of emotions. Chuffed we have a boys name finally. Waiting on another scan now to say who baby is once and for all. 6th - Mummy and big day with X. Treetops crazy golf, Lego shop, chocolate cake and bus rides. 10th - day out with Sorreya buying Little its first little bits! Rainbow outfit and new playmat. 15th - naming Little Lucas Elias Morgan 💙🌈 22 weeks pregnant. 19th - Xander feeling Luc wriggle. 23rd - dancing with the boys to the superman song! 23rd - new armadillo city stroller for Zac! 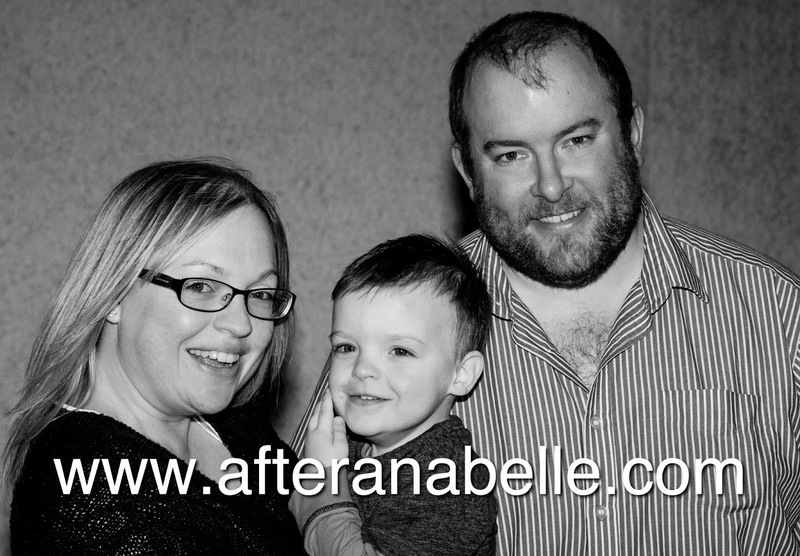 24th - our together 10 years anniversary, and an evening at The Stuffed Dormouse. 30th - watching this alien baby move my tummy around! 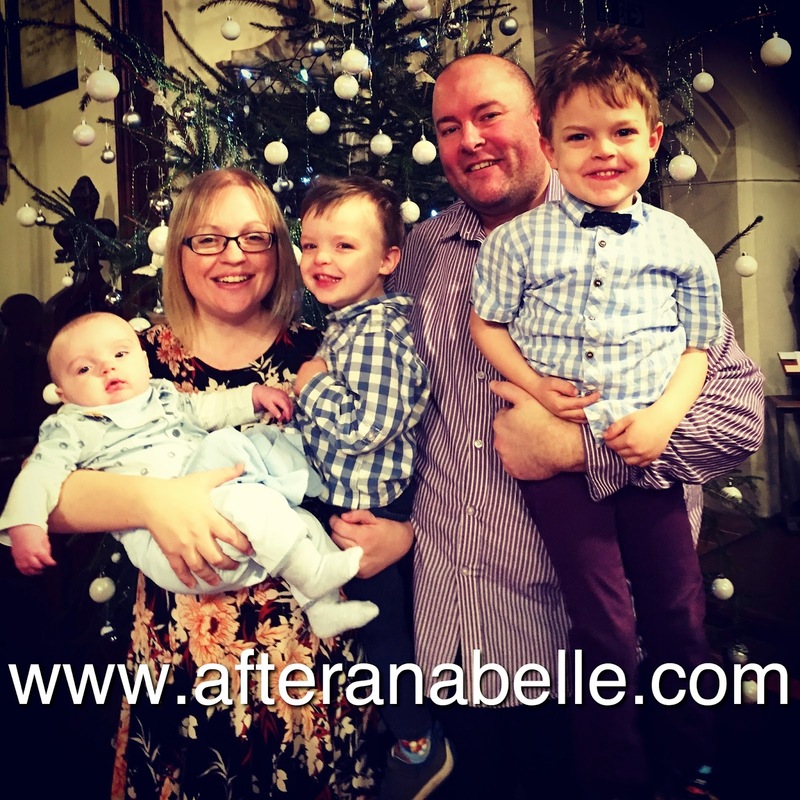 1st - Mason and Isla's christening and a lovely day with friends. 5th - Bestie's baby boy Perkins born! 7th - train ride, treasure hunt and shopping in Cardiff. 15th - listening to Zac sing along to all the frozen songs. 21st - this little piggy rhyme with the boys. Shrieking with laughter! 26th - Zac loving his Elsa dolly present for half birthday. 27th - boys enjoyed their gardening day with Bampi and then pouring water over each others heads! 29th - first day of holiday - blissful morning sat on westward Ho beach after a short stroll from the caravan. Really relaxing day! 30th - Bude swimming pool. Boys loving the waves and water slide. First times on water slide. 31st - Westward Ho beach, watching boys play in the sea puddle. Bowling in afternoon. Zac first time but getting only strike and winning game! Jon coming last haha! 1st - cinema to watch King fu panda. Zacs first time at cinema. Afternoon in Plymouth to play with cousins. 2nd - pirate crazy golf, go kart race cars, gnome garden. 3rd - wollocombe beach. Gorgeous family day and gorgeous family photo on an evening stroll later on. Perfect family holiday week! 11th - my baby shower afternoon tea at Cwrt Bleddyn. 7th - Xander coming out of school with 5 stickers and his teachers telling me how kind and helpful he's been all day! 9th - ITNG live! Zac's absolute mesmerization by it! 19th - Our perfect Lucas Elias Morgan born, 7lb 6oz at 16.32. Completing our rainbow family. We couldn't be more thrilled! 20th - boys meeting their new brother. Gorgeous photo - my favourite of the year! 22nd - bringing Luc home. 29th - reading We're Going On A Bear Hunt with the boys! 30th - our first family of 5 afternoon out. 31st - watching the boys play in Grandma's garden. Football and then running into each others arms, calling out names for a big cuddle with eachother. 3rd - Day in Cardiff and Jon ordering my eternity ring! 11th - lovely day at the farm. 19th - the boys and the baby. Singing 'baby Luc I love you' to him in the moses. 28th - Folly Farm day out! 29th - Morgan Jones park Caerphilly splash park! 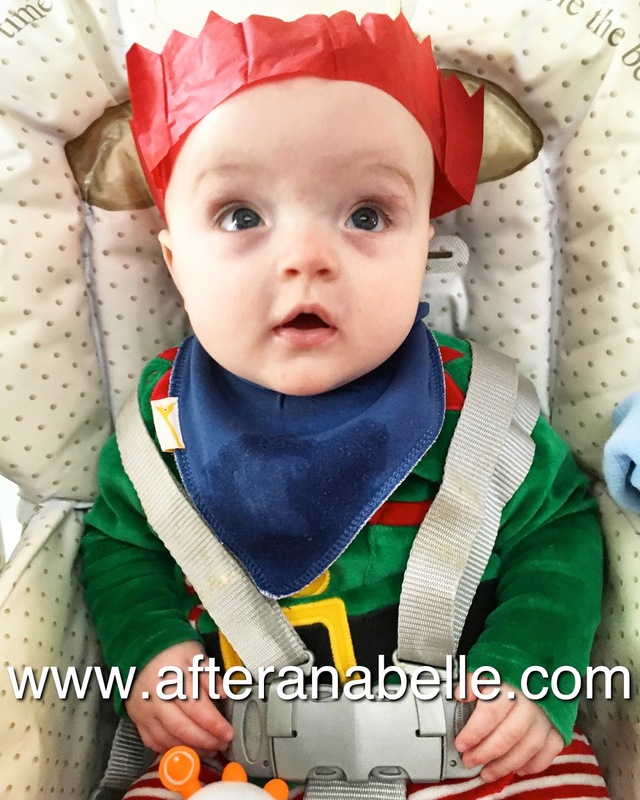 30th - winning a water babies course! 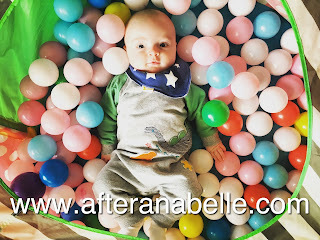 31st - mambo soft play and Cardiff bay beach with Xander. 6th - Lucas first smile age 7 weeks. At Xander playing peekaboo with him! 28th - Zac being fabulous at potty training. No accidents at nursery all day. Day 6. 14th - Xander's 5th birthday! 16th - Xander's Bumble Bee Transformers birthday party! 17th - reading Charlie and Chocolate Factory with Xander. 18th - Costa Coffee with Zac. 19th - Luc listening to Sugalump and the Unicorn, and smiling and really looking at book. 20th - Xander dressed as Charlie for school Roald Dahl day. 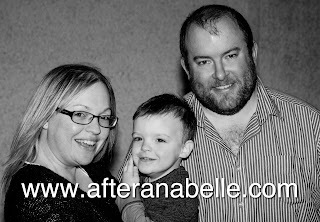 1st - Xander's truly spectacular parents evening. Kind and friendly, well-behaved, and above average throughout his baseline assessment - working in outcome 3 already and towards outcome 4 by the end of reception! Amazing! Grouped with year 1 pupils for maths. 4th - Xander's first reading book home! 6th - Luc's first little giggle - at his Daddy making funny noises and faces. 7th - the farm with small. Zac writing Z for Zac in sand! 16th - Zac star of the day in nursery for Makaton signing. 25th - Zac getting his place in school nursery for January! 28th - Zac pointing remote at tv - saying 'turn to Peppa' as of it is voice activated! 6th - Xander opening his reception Christmas concert and welcoming everyone. 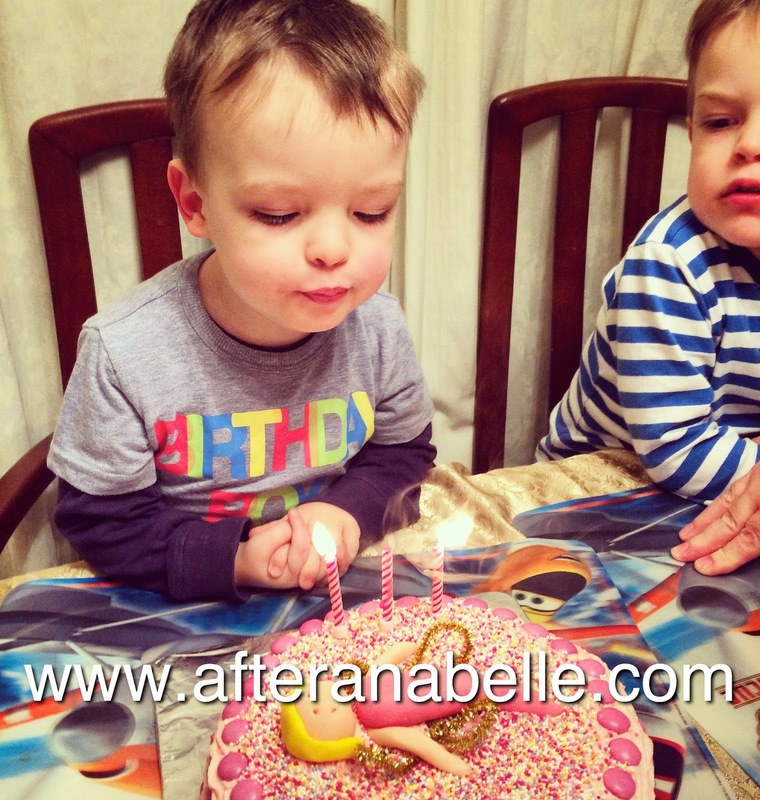 10th - Reuben's birthday party day in Plymouth. 25th -Christmas Day 2016. 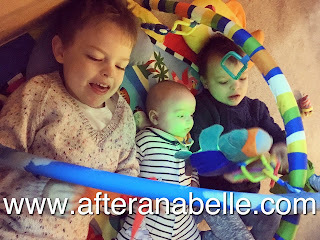 Lucas face of wonder at his light up rattle, Zac adoring his fairy and Xander loving his slime! 26th - Christmas dinner with the Villars family. 27th - 12 days of Xmas trail at Duffryn gardens. 27th - Buying Zac's school shoes. 28th - Zac's last day at Acorns. 30th - Christmas buffet with Sorreya Keith Oscar and Jac! 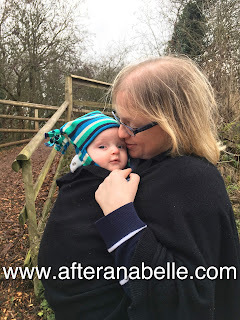 31st - Boating lake walk and scoot, Luc's last walk in the carrycot! Sob! 31st - whispering sweet nothings into Luc's year at bedtime as the magnificent year of his birth comes to an end. One hundred and thirty five moments recorded, not to mention the ones I probably forgot to write down. But if I had to pick just one moment of all, from the entire year? It would be this one. My three rainbow boys, together for the very first time. 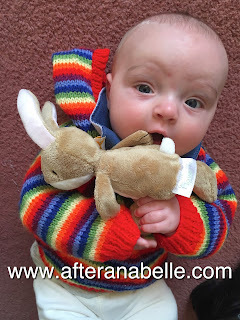 After Anabelle Raising Rainbows. This was my 2016. Wishing all I know a peaceful and joyous 2017. Last month the middle boy had a birthday! 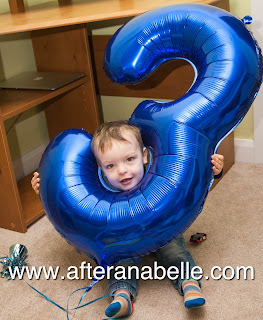 Our lovely Zachy Small is three! There is no way Zachary feels anywhere near big enough to be three mind you! My small. Still my Small, he really is a doot for his age; 89cm tall, still wearing 18-24 month trousers and only just going in to 2-3 on top. Only a size 6 shoe. So Small, yet a month from now starts his school nursery journey! He doesn't seem at all big enough - at his nursery starter meeting last week the other Rising 3's seemed to tower above him! The uniform shops seem to agree he is too small too - hand-me-downs from Xander's nursery start are ridiculously oversized in 3-4 and so new uniform is being bought - I've been struggling to find 2-3 uniform still in stock - so bits and pieces are coming from a few different places. But we're getting there, jumpers and tshirts are bought. Trousers and shoes we'll think about after Christmas now. I'm as nervous for him starting nursery as I was for Alexander. I thought it would be easier to let the apron strings unravel a bit this time around - but it proves that different children give you different worries and it is no easier with the nerves of starting school at all! With Xander (click to open) it was all about my own resistance to change, letting him go, worrying about others looking after him for half a day every day, I worried about him being ready of course, but I knew on the whole he would be ok; he had that kind of personality and he gelled fairly well in most situations. My compliant and easy going little boy. This time around I know the team that will be looking after Zac. They're vivacious and dedicated and there are no worries there, although I'll admit I'm not really ready to share him that bit more! Still I feel unnerved that he has to grow up. I worry that he isn't really ready. I worry that we're rushing him. Even more than I worried that Alexander wasn't ready. Zachy is less easy-going than his older brother, much more sensitive, quick to react, quick to be upset and very much still a toddler. A baby. Oh how he will change so very quickly when he starts in school. All of a sudden he will grow up too much I'm sure. 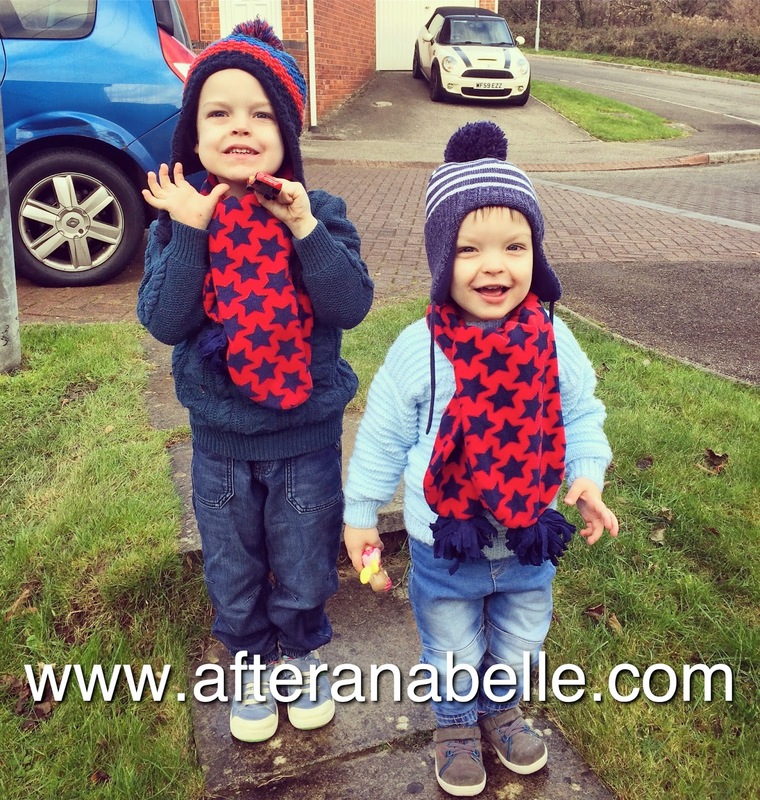 Thrive just as his big brother did after all my nerves of him starting school nursery. I hope so anyway! My beautiful beautiful boy. Three. It sounds so big when you are so Small. I'm not ready for you to be big! But you? You love being big! You are forever telling us that you are NOT a baby. This is since the arrival of your baby brother. You are a Big Brother now and you love it! On your first visit to the hospital to meet him you couldn't take your eyes off him. In the beginning you called Lucas 'it' - but in the most adorable affectionate way; requesting of us that 'I hold it'. When he was brand new you didn't like it when he cried. He was too noisy! 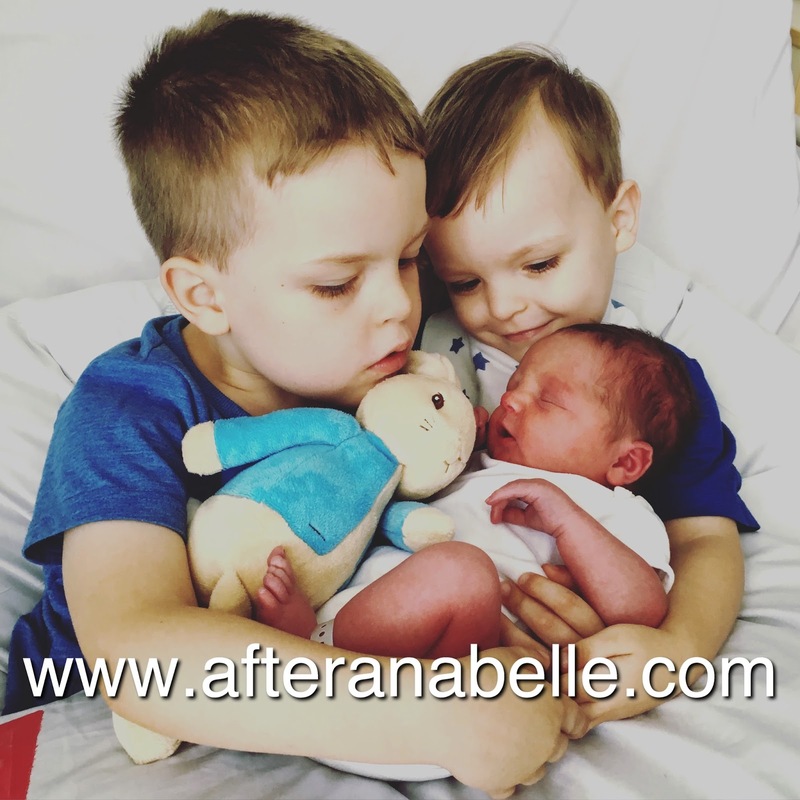 You make us so proud in how you care for your baby brother, you are always talking to him and giving him cuddles, or proudly telling strangers when we're out and about that he is your Baby Luc. Your Baby. 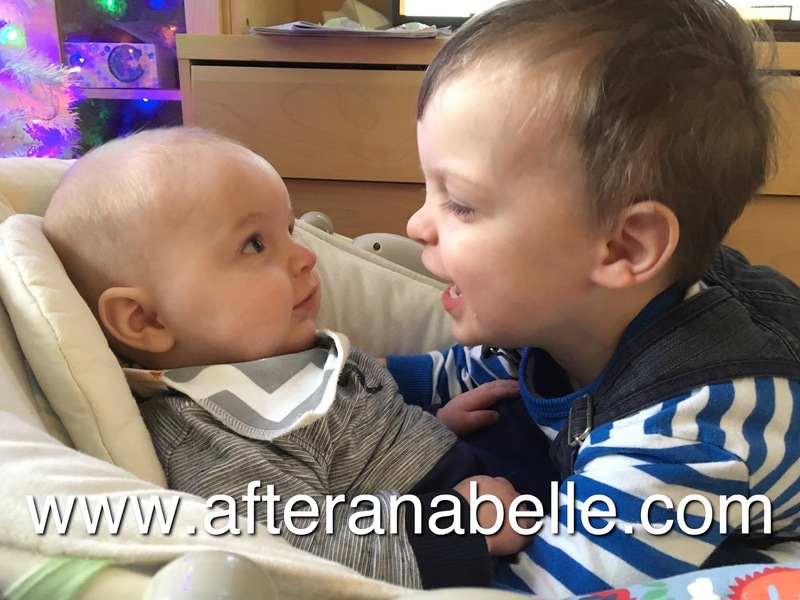 So often you and Xander fall out now about whose baby brother Luc is - you not accepting that he is actually baby brother to both of you! There really is so much to tell you - you've had an amazingly busy six months. Learning and growing. Changing. You are so chatty to everyone. To a complete stranger in a lift, or a queue, or the cashier at a till, other children playing at the park, you'll turn around to and say 'I'm Zachary' or 'I'm Zachy'. Your vocabulary has exploded all the more and the way you talk has changed, more grown up. Nearly everyone can understand everything you say now. It felt like your speech grew up overnight when Lucas was born. You have these adorable little phrases. Some are beautifully reminisent of things that Xander used to say when he was the same amount of big as you. Things like 'I not sleepy, it good morning' to his 'I not sleepy, I wake up'. You still make a 'b' sound when you should say 'v' - but it makes for the cutest expressions. 'I lub you' 'It too heaby'. 'Seebeeseebees' for CBeebies. You like to tell us who you want to talk to, most days I hear 'I want to talk to Mummy'. You are already asking 'Why? ', which feels way earlier than Xander's 'Why' stage. At three you love Ben and Holly, you love having a story read to you, you like singing songs; my favourite at the moment is listening to you sing along to Emeli Sande 'Wonder'. 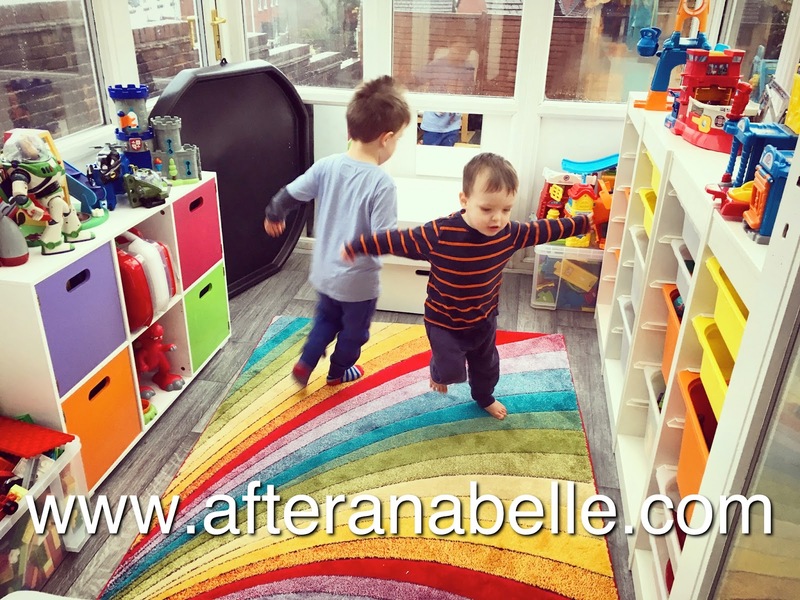 You love Happyland toys and role play, fairies and princesses and pink. I love watching you play with Xander as you discover imaginary play with him; your little people go on such adventures with you! You hate loud noises. Genuinely petrified of crowds shouting and screaming, noisy parties and hand driers in toilets. It is ironic really when you can make the most piercing scream that goes absolutely through me every time you make it. You're no longer that keen on having your photograph taken, unless you are caught in exactly the right mood! You're going through that phase. Or at least I hope its a phase because you have very snap happy parents - wrong family boyo! At the moment I'm winning through bribery and corruption or stealth photos! Haha! You love swimming. You are a little fish. So confident already and have been since before you were two and a half - I really should've have had this on your last blog update. You surprised us all on a family swim one day - a woggle around you and off you went, kicking your legs, trying to use your arms and speedily travelling through the water. You totally blew us away! 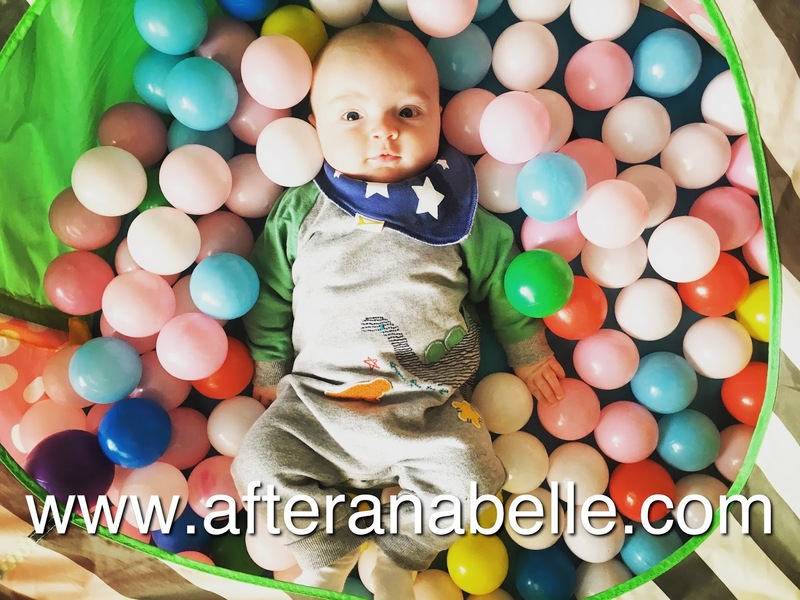 You've started swimming lessons now and now you'll swim around with a mini woggle under each arm instead of a big one around your tummy! You my boy are so physically brave and fearless. You love the challenge of climbing and bouncing. I'm absolutely convinced you will be the first of my children to break a bone. Just a few months ago we turned around at the farm to find you dangling by your arms from some pretty high monkey bars. Needless to say Daddy dashed over to catch you before you let go. Gulps from Mummy. You will turn me grey! You are getting so independent and are as determined as ever! Absolutely refusing help now until you ask for it if you have decided that you will do something by yourself. It amuses me how much you want to try doing for yourself compared to your big brother who would be happy to still let me to absolutely everything for him! Zachy you are such a sensitive soul. You can be such a Jekyll and Hyde; you'll even tell us if you're feeling Happy Zachy or Grumpy Zachy! You're sensitive to the way others interact with you, you are a child who loves his own space to play and sometimes needs that space away from others. Sometimes you really struggle if someone invades your space. But equally you love the joy of the game with other children too. You're still learning how to interact with the world. You show such beautiful concern for others when you can see they are upset - you come along and ask what is the matter, or pat someone shoulder to show your concern. You're growing up far far too quickly. 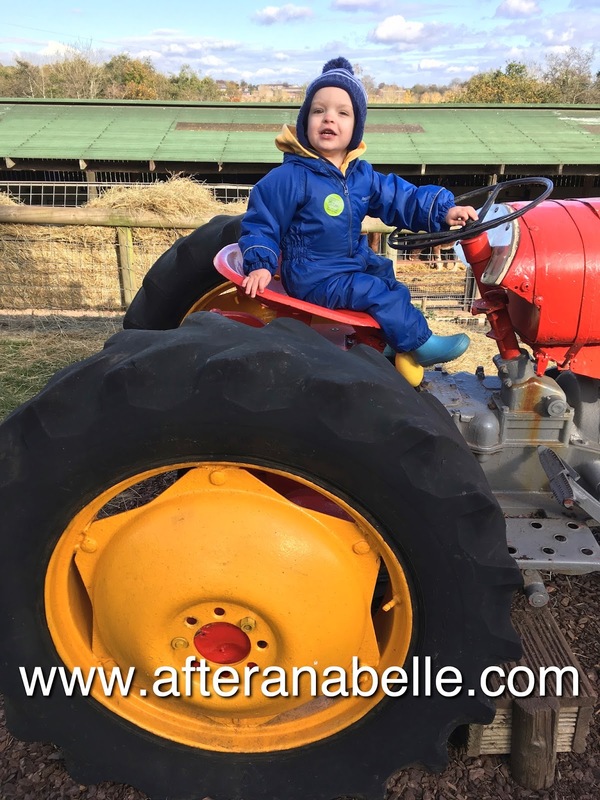 In just a few weeks you will start nursery class at school! It is going to be so exciting, new adventures, new friends, new things to learn. More big changes! This year we're changing our Christmas routine. Even a year ago I wouldn't have believed I could ever feel it was the right change to make. To be honest, I'm not sure it is the right change to make. We're not going up to the cemetery Christmas Day. 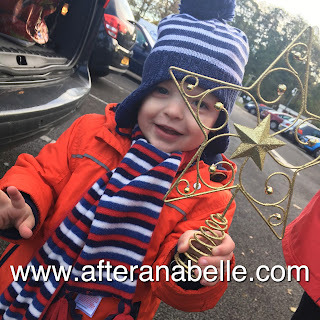 Instead we're going to go up with Anabelle's garden gift things on Christmas Eve afternoon. The guilt is already in the pit of my stomach, like we're cutting our daughter out of Christmas. Doing something we promised we'd never do. Not doing something we promised we'd always do. Not going to her on Christmas Day. Christmas has been bothering me for weeks. The nagging feeling that it wasn't fair on the boys to rush their Christmas morning, or clock-watch, the potential of their mother getting stressed and anxious and snappy to get out of the house by a certain time and up to their sister so we had time to fit everything in before cooking dinner. 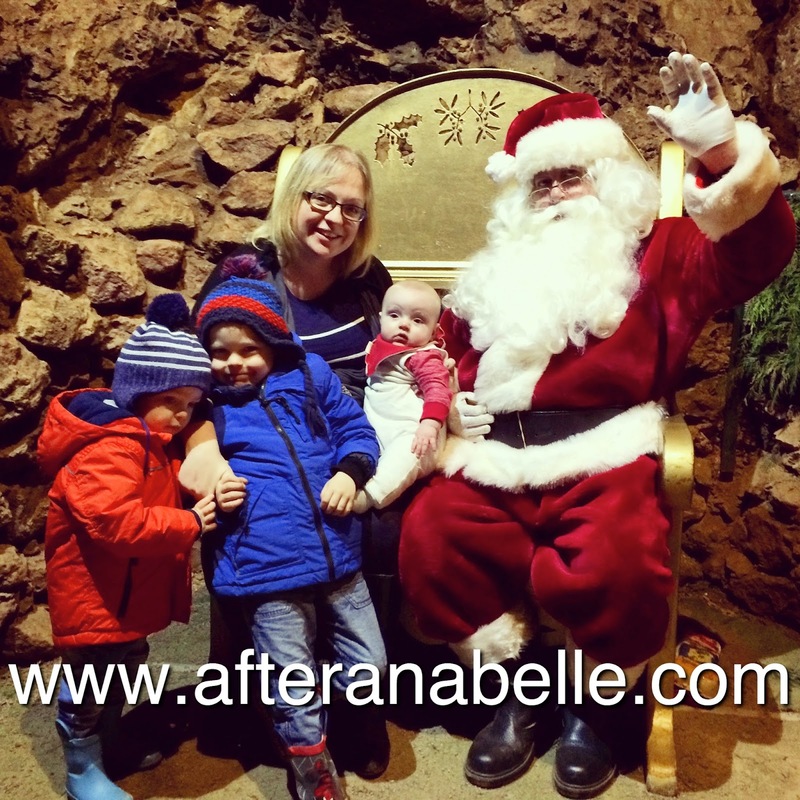 So I floated the idea to Jon at the weekend that maybe we should go to Anabelle on Christmas Eve. This year to see how it felt. To see if it could fit and become what we do at Christmas. That maybe while the boys are so young their entire Christmas morning or even the day at home should be the priority. Not rushing them, rushing presents, rushing getting them dressed, rushing up there, and rushing back home. Not giving ourselves time-pressures on Christmas Day that would threaten to bubble and boil and spoil. I don't want to rush my time with Belle up there, and I don't want to rush my time with the boys at home. So this year we're making a change. It feels the wrong thing to do and the right thing to do all at the same time. It feels like maybe a slippery slope. I don't know. This year we're so excited for Christmas. 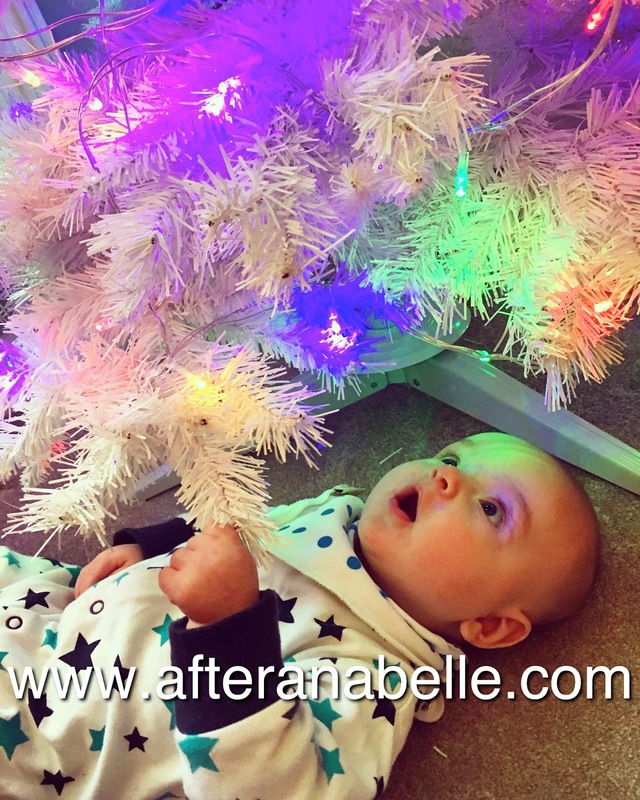 Baby Lucas's first Christmas. Its a big deal. 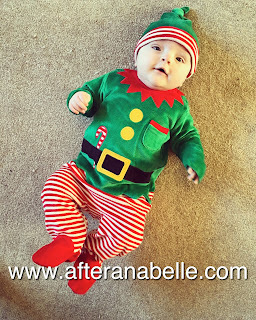 I've already enjoyed dressing him up in the novelty Christmas outfits, my little baby Elf, and his little Christmas Jumper. I've chosen what I'll want him to wear on Christmas day and the 'My First Christmas' pyjamas he'll wear to bed Christmas Eve. And of course for the older boys too. Wanting to make it magical for them. It has taken us years to reach excited. 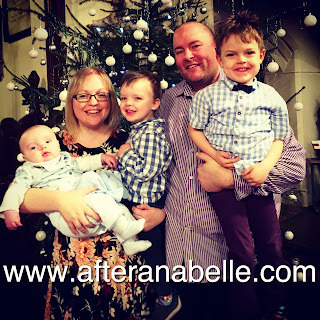 For those first four years we went through the motions, mostly treading water, knowing that Boxing Day would wipe me out completely after holding it together Christmas Day. It has taken us all these years to reach this point and it had to be a conscious effort to do it. Deciding to try so very hard to embrace Christmas. Only because of the boys. An Alexander that understood Christmas deserved a Mother who did better at it. Didn't crash at some point within it. Year five was a bit hit and miss. But last year, her sixth Christmas, we managed it, a happy build up AND an entirely happy Christmas day. A corner had been turned. Somehow I felt like we had this whole Christmas thing sorted out now, managing the the turmoil, successfully riding the low without getting dragged under for the first time in six Christmas'. But now, even as we approach her seventh Christmas this time of year is still surrounds us in some turmoil. Still ever aware of all that we're missing. The little girl party dresses and shoes in your face everywhere, the cute pink and sparkly Christmas jumpers and matching Mummy and Daughter Christmas print dresses that are all the rage at the moment. It stings and hurts as much as it ever did and always will. The things I can never do with the boys. So maybe I didn't have it quite so sorted out as I thought last year. Because attempting to make a change is hard, leaving me jittery and not really knowing how I'll react to it until it is done. Maybe we should be going up there Christmas Day. I really don't know. I feel torn and guilty. Mostly just wishing we didn't even have to contemplate grave visits for our daughter at all. Trying to fit four children into Christmas when we can only see three. Trying to be fair to everyone. I'm going to say it again. Another month has WHIZZED by! 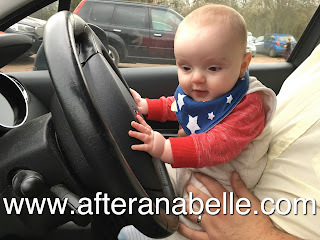 It is going so fast that he is already four and a half months before I've found a moment to type up his blog! 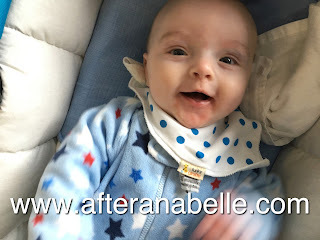 Lucas really is such a happy gorgeous baby. He only even has to half smile at me and I melt; it is so easy to enjoy him. I've been lucky with them all to be fair - none of the boys have been difficult babies - but Lucas seems especially content. My Little. The only fuss he makes is hunger and tiredness. 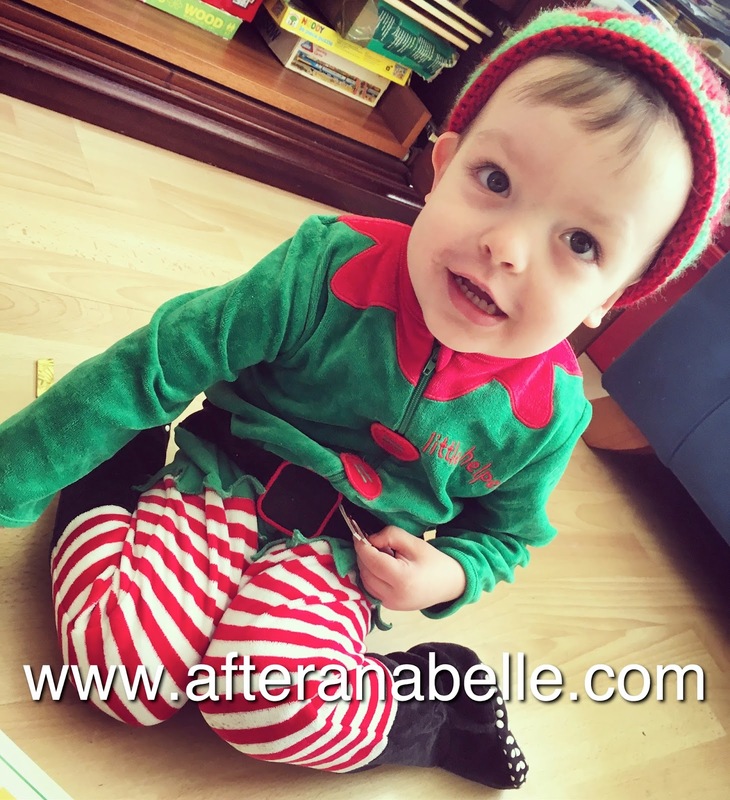 He is happy to sit and play in his chair or led playing on his mat, exploring his toys and just watching the world going on around him. So easily pleased with just having company. He has spent the last month discovering how to play. Reaching out for his toys, feeling them with his fingers, grabbing, pulling toys to his mouth. He adores spending time on his new playmat especially; that was a good recent buy! Beautiful baby Lucas. You are four months old. Four months! You are growing and changing, becoming more and more the little person and not just the little baby. Getting nosier and nosier. You just want to sit up now and look around - every time we try to recline you in our arms you are pulling your head up as if to say 'Let me see, let me see'! You are interested in everything. Especially your brothers. You so clearly LOVE their attention now, excited looks of adoration across your face whenever they talk to you! You stare at them so intently. And boy do they so obviously love you too. You are THEIR baby! The three of you absolutely melt me together. The Morgan boys. The world is beginning to amuse you. You give the most beautiful beaming smiles, and oh you've started to chuckle. Tiny little giggles that we're just waiting to turn into wonderful huge big belly laughs. Your first laugh this month was for Daddy. He was pulling funny faces and making funny noises and you chuckled. Beautiful delightful boy! There is something that is so infectious about a happy baby. 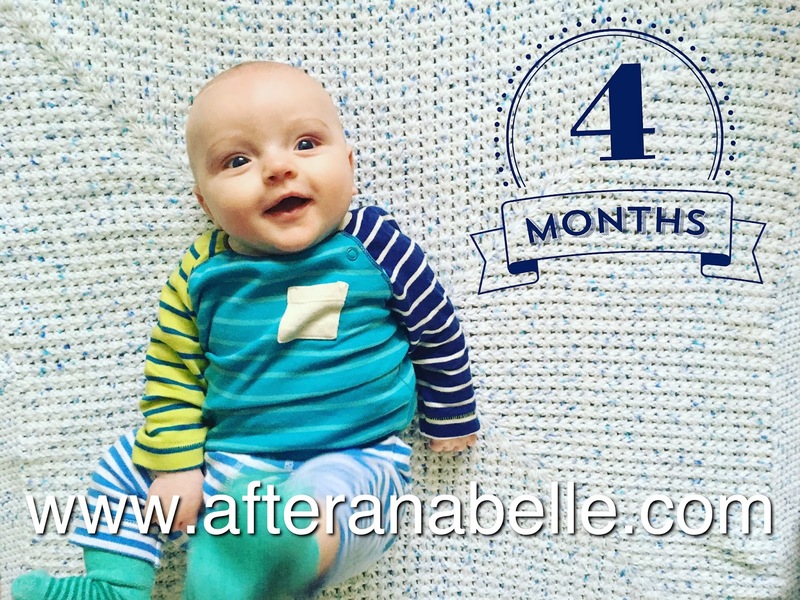 At four months old you are 14lb 5oz and now comfortably into your 3-6 month wardrobe. Your looks are beginning to change and I think you're starting to resemble Zachy more and more as a baby. Predictably, like your brothers over the last month you more or less completely lost your hair. 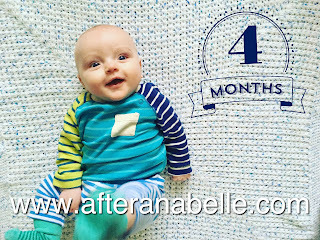 Now at four (and a half) months your hair has started to grow back but it is so fair you still look bald. Just like your brothers around the four month mark! This month you have started to put weight through your legs and push to stand ever so briefly on our legs. You are getting stronger and stronger. On the floor now you are ever so quick to roll on to your side, I keep waiting for you to flip right over on to your tummy but that pesky arm is still in your way! Your learning how to use your arms and hands, and hand-eye co-ordination to grab things infront of your to explore. You reach out now to touch and feel. You've enjoyed looking at your 'That's not my books' really pushing your hand over the pages. 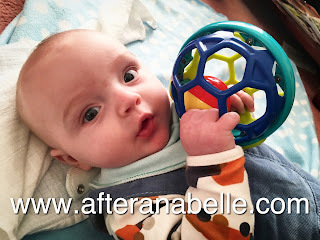 You love grabbing toys now and looking at them or moving them around in front of you. Your favourite toy this month has been your playmat and the light up turtle and soft feely book that hangs from it. Daily routine is still much the same as last month with generally four naps of varying length throughout the day. Some days you'll nap for only 20 minutes or so at a time, others you'll sleep for two hours - it is so hard to predict. I know you would nap for far longer if I was able to hold you while you slept, but baby you are the youngest which means you rarely get the luxury of being cuddled for an entire nap. Somebody always needs Mummy. Night sleep was going so well - too well - for three weeks or so you had consistently started to sleep through and I think Mummy counted her chicken's a bit too soon! And then you had a little cold - and maybe a four month sleep regression - but for the last two weeks there has been at least one wake up a night again, some nights two or three! Oh it could be worse, way worse and one/two wake ups is nothing at all really - but it is surprising how quickly you get used to getting a full nights sleep again even after only three weeks! Last night you didn't wake me up until 5.00am so I'm kind of crossing my fingers you're going to start stretching out again - but now if we could get your brothers to quit their wake-ups too then we'll be well away. Horrible winter germs. Your next update is already fast approaching and we have your exciting first Christmas month ahead of us. I'm so looking forward to seeing how mesmerised you are by all the lights and glitter and sparkles! What will you have discovered by month five? My wonderful squidgy baby. Grow up slowly. In love with you.